Gin lovers! In a fit of Ginspiration (sorry, we couldn't help ourselves), we have created a range of gin experiences that we thought might just take your fancy. Gather around ‘Old Nick’, our beautiful copper still that sits in the cellar lounge of the Bella Luce Hotel and choose from a half hour ‘Gintroduction’ tasting session (that includes an introduction to the history of gin and to the Bella’s small batch distillery, accompanied by a Wheadon’s & tonic and a tasting of a variety of London Dry style gins), longer sessions that develops your understanding of the role of different botanicals and flavour, or our unique and immersive ‘Design Your Own Distillation’ and ‘Distil While You Dine’ experiences that will see you take away a gin of your own design. Gin has a fascinating history thanks to the variety of styles and possible flavour profiles. Every experience at the Wheadon’s Distillery begins by guiding you through these styles so that together we can discover why you love your favourite gins. 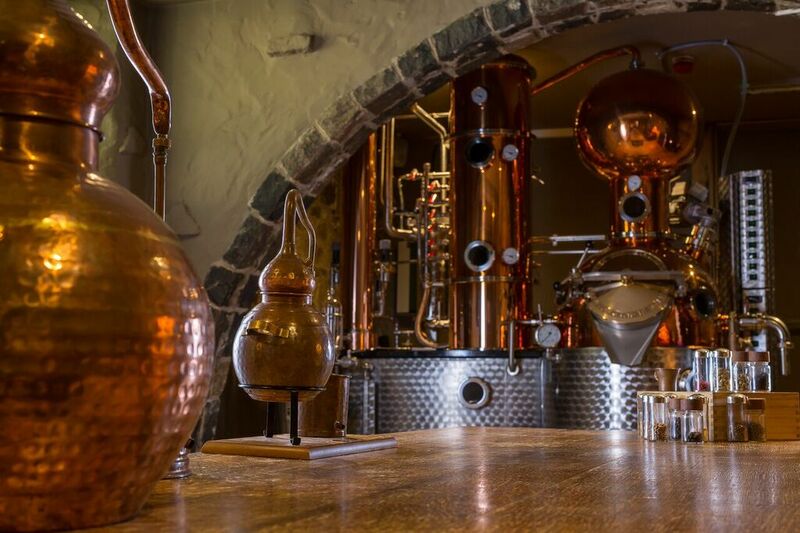 Gin tastings and distillery experiences at the Gin Hotel can be arranged around a long lazy lunch, classic afternoon tea, or dinner in the Bella Luce’s award-winning restaurant, or as part of an overnight stay or multi-night break. Regular ‘Gintroduction’ tasting sessions take place at 4pm, every Wednesday and cost £20 per person (over 18s only). Booking is essential. Tastings, tours and distillery experiences require a minimum of four people and can be booked for a time to suit your group. Why not book an evening experience and reserve a table for dinner in the Bella Luce’s award winning restaurant? Wheadon’s Gin’s ‘Breaking Down the Botanicals one hour experience costs £35 per person, whilst an immersive two hour ‘Design Your Own Distillation’ session costs £45 per person, excluding dinner.